I am so thrilled to have found them. First time I've found relief in 6 months. it's helping me, I'm enjoying it. Im telling you, its working real good. Its the first improvement Ive had in several months. Im not back to where I want to be but getting there. I really appreciate your follow-up call. It speaks volumes about the quality of your services. I've tried wrapping it with other things and I could never make it stay on, and when I wrap this one it stays on pretty good. I'm pleased, I like it a lot. Thank you for your great customer service and the KB tape was the best I have ever tried. It saved me. Thanks again. And I will return as a customer. I really like it a lot, 4 treatments a day and I'm feeling better. Being able to sleep at night now. Much much better, I do recommend this product. After a few days I could tell the difference. 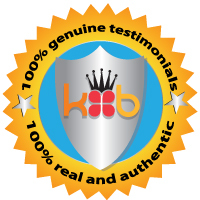 I have a positive review regarding my recently purchased Cold Care and BFST King Brand products this past week! I developed Plantar Fasciitis approximately 4 weeks ago on my left heal! Suffering a couple of weeks with extremely painful heal pain, I was informed by trainers that I have Plantar Fasciitis! I was given the usual treatment remedies, stretching, massages, etc. I looked up the condition and discovered King Brand products! I made a call to customer service and 3 days later I started using both products immediately! Within one day I began to feel much better and after 5 days of 3 times a day with both products, I am so much better and walking without extreme pain! I am hopeful that by the end of next week to be completely pain free! That is my goal! These products are the real deal! I am about to order the BFST knee wrap to help me with my partially torn meniscus! Cannot hardly wait to start! Great Company and Outstanding Customer Service! My name is Clay Buckelew and that is my review! I like it so much better than what I was doing, just using an ice pack. That was just not working. The other thing that's really nice is that it's not chunky like an ice pack. Its actually one of those gadgets that actually works. I absolutely love it. I already feel relief. I have been dealing with golfers elbow for 2 years in both elbow, I dont even golf. Ive done injections, Ive done therapy and this seems to be doing the trick. I've used the BFST and ColdCure Back Wraps to deal with a back injury based on a recommendation from my Physiotherapist. Works really well. Comfortable and well made. The ColdCure gel packs are amazing -- they produce a consistent 'cold' over a long period (20 mins plus) I've tried the cheaper drug-store brands and they just don't compare. I highly recommend King Brand for anyone doing injury recovery or pre-workout therapy. This seems like its going to be the perfect thing for me because I notice within 3 days that my foot felt better. Ive been walking with crutches, I am able to put full pressure on it within 3 days. The equipment itself is by far even better than they said it would be! I love how they fit! Thank you so much! I really appreciate your company , your products and your follow-up consultation. I love it. It's helping out with my tendonitis. so glad i found this. The wraps are very comfortable and easy to put on yourself. I have a meniscus tear. Nothing has helped me until I found the Knee wrap. So far so good, started when the parcel arrived. It's coming along well, I'm starting to feel better. I really love the BFST. It feels like it's deep within the shoulder and it feels great. I've been using them and they're working quite well. I wished I had found it earlier when it was bad. Over the past couple days of using the BFST, it's almost like new. Oh, I love it. I've actually overdone it, lifting some stuff that I shouldn't have, so I had to go back to the cold packs again. The ColdCure is definitely helping. The products have been great. I have an Achilles injury from running and it's been helping tremendously just by icing. Overall I'm very pleased with it. Doctors refused to operate on my wrist because of glucose levels. I was able to repair both wrists so that they are not painful anymore. It was so bad in the morning that I would almost cry from the pain. It really has helped me. The BFST Knee Wrap is what helped prevent me from Meniscus Surgery. I'm doing very well. They're working great. I've already recommended them to several people. I was kind of skeptical when I first ordered it, I didnt just want to run out to the Dr, you know a foot Dr whatever cause I don't even really know who I would go to so I thought based on what I read on your website as far as things to do and not do, I thought well that stuff kinda makes pretty good sense as far as trying to heal from an injury so I went ahead and ordered the stuff and its done what it is advertised to do so I thank you very much. And the stuff is very well designed, its a good product. I suffered for almost 2 years from plantar fasciitis. It was so bad I thought I would never be able to run again. Then I found your site and ordered both the BFST and ColdCure foot wraps. They turned everything around for me. It feels so good to be able to be able to be active again. Very comfortable tape that stays on. Arrived super fast. I think long-term this will be very beneficial for me. I've used it quite a bit and I'm finding some difference so my knee is definitely improving. I really am surprised, my knee has been bothering me since back in May and I've been icing it and putting heat on it and all this kind of stuff and its just gotten so bad, just the few days Ive used that, the wrap, I mean I cant believe the difference. I still have a ways to go but I just find like from where I was, if I sat down when I go to get up like I could barely, you know I would have to stand for a few minutes and try to move the leg to get the knee going, I mean since Ive been using it, just a few days, I can get up out of my chair and I don't have that struggle, so yeah I am quite amazed. Once again, thank you very much for the professional approach on calling back. You certainly didn't have to do that. In todays world you certainly do not see that kind of professional response and I do appreciate that. I've been using it so it seems to be working. I'm not taking time off, I'm still running and stuff, so it's probably not healing as fast as possible. But it is helping, I know that. I like the wrap. I like how it feels. I love it. I think it's great. I'm very satisfied. I will not hesitate to recommend your products for anyone with an injury. It's helping out tremendously, her tendonitis in her ankle is getting much better. It's much better than I thought, I thought this package was gonna be freezing but it isn't at all, it's very comfortable. I'm very happy with it. I have been very happy with the results of the heat wrap. I sprained the ligament in my knee and was discouraged that it didn't seem to heal as soon as I had expected. So I found your product online and ordered it immediately. I was already feeling better in about 3 days. I have been using it for a week now and it continues to feel better each day. I sometimes forget that I had hurt it. I am using it 4 times a day. I was very appreciative of the girl that called me to ask how I was doing and all her advice in using the product. Thanks again. I'm loving the product. It's a great product, I really like it. It's helping my shoulder. It worked out really well, I really like your product. I appreciate a company that cares enough about their product that they'd call to make sure that you're happy with it. That's great. It's working very well. I've been using the heat pad about 4 times a day. It's really helped out on the left shoulder, it's really made an improvement on that. I'm really happy with that. I love it. It is pretty wonderful. It's so well designed, you can even sleep in it. Very nice. I'm in misery, that ice wrap I sleep with it every night and I wake up feeling a lot better in the morning. I love that pack because it's not hard, it's like soft, you know, pliable. I do like it very much. It works wonderful and I'm really pleased with it. I'm happy with the King Brand product. I figured they're one of the better ones. I purchased other products over the years and they tend to be a lot more bulkier or the gel tend to not hold its shape and so on so I've been very happy with the King Brand products. I think it's improving and if it keeps going the way it is I'm going to be really happy. I'm already telling other people, so I think it's good. That's really nice of you to call and to even care after you sold the product. I think that is very impressive as a company. That's great customer service. It's helped me a lot, I've only put it on 3 times but I can significantly feel a difference. It's helped me a lot, I mean it doesn't 100% cure me but man it made a difference. They're wonderful and I tell everybody about them. They're a great help. I have just been doing the ice and that's been helpful, and I like the way the ice packs sit in the knee brace so that's nice. It's a great product and I will certainly refer it to friends if they need it. I never seen anything like it before, everything else is sort of like kloozy, but this is so well designed and easy to work with. I really liked the ankle wrap and the ankle wrap worked so well for me that's the reason I purchased the knee wrap. I like the products an awful lot. They're well made products and I'm very pleased with them. I'm very satisfied with the products. I've had significant improvement using it. I'm using the product, I'm really pleased with it and very thankful too. I have been using the coldwrap mainly because I had a lot of swelling. I do feel relief from the ColdCure as a matter of fact I'm doing it twice a day so I can keep a steady process, so I can see if I can maximize healing. I really like the shape of the device, it's really easy to use it's sturdy I like it. I keep it in the freezer and just use it twice a day for about 15 to 20 minutes and I feel it does help. They are great so far, I really do love the product and it does help out, if I'm walking around at work I bring them with me and I can take a break and put them on there, and it's great. I'm super happy with your product. I love the way the ice packs, they're not ice packs they're cooling packs and I put them in the refrigerator. I love the way it holds it's cool. I'm really impressed with King Brand, that y'all care enough to even follow up with customers. It's phenomenal. It's working wonderful. I'm just amazed, this is maybe my fourth day and I can already tell a huge difference. I love the tape, it gives me a feeling of confidence and a feeling of comfort. The only comfort that I have had with this condition is because of your package. I really appreciate you all taking the time to call to follow up on the product, I'm really impressed! The cold pack I love, the arm thing is great because I can walk around with it, love your cold pack.